Azzurra and TFS - French Spirit. 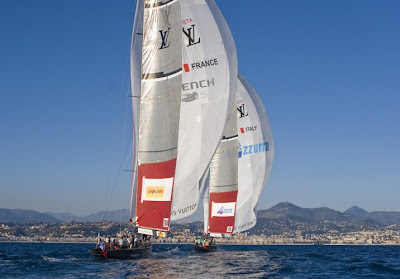 © photo Credit must read Bob Grie Louis Vuitton Trophy, Nice Côte d'Azur. It was another good day for sailing off the coast of Nice today. Three flights of two matches each were held. Artemis raced in one match against Team New Zealand at 0900 this morning. We had a slightly worse start than they did and they sailed real well to push us back slowly but steadily from there. Nothing major happened in the race as far as wind shifts or breakdowns. We raced in the Northerly drainage wind again which comes in from 340 degrees. Our race was fine as the wind held up. After we finished and had gone ashore, the wind died and the next flight was delayed for about two hours. The second flight was very light...6-7 knots and then the third flight got under way around 1500 and they had 8-10 knots. The committee decided not to run our flight, in which we would have faced TeamOrigin as we would not have started until 1615 and it would have been dark by the time the boats got in. So we are first up tomorrow against TeamOrigin. We are getting used to these early starts. We have never won and early race yet so hopefully, we can reverse that trend tomorrow. Other highlights of the day were that Synergy got the goose egg off their score by beating All4One in the last flight of the day and Azzurra continued to do well beating Synergy and French Spirit, running their score up to 4 wins from 6 races for second place overall.